Cover up with a wide brimmed hat and clothing. Safe sunscreens are in stock and on sale for a limited time! Many injuries and pain complaints are often tendonopathies; rotator cuff, elbow (golfer’s and tennis), patellar and Achilles tedninopathy are among some of the most well known. Tendons, which connect muscle to bone, are made of dense collagen fibers. They are innervated with certain nerve fibers, more than muscles. These conduct pain signals that cause the tendon to be more sensitive. When a tendon is stretched, the collagen fibers stretch out like an elastic and temporarily deform from their original wave pattern. When the tendon exceeds its range, the collagen fibers fail to return to its original pattern. Over time, a tendon can experience micro or partial tearing resulting in a tendonopathy, or tendon over use injury. Tendon over use injuries can be caused by muscle imbalances, poor biomechanics, lack of flexibility, poor blood supply, and chronic degenerative changes in the tendon. The most common tendon injuries are tendonitis and tendinosis. 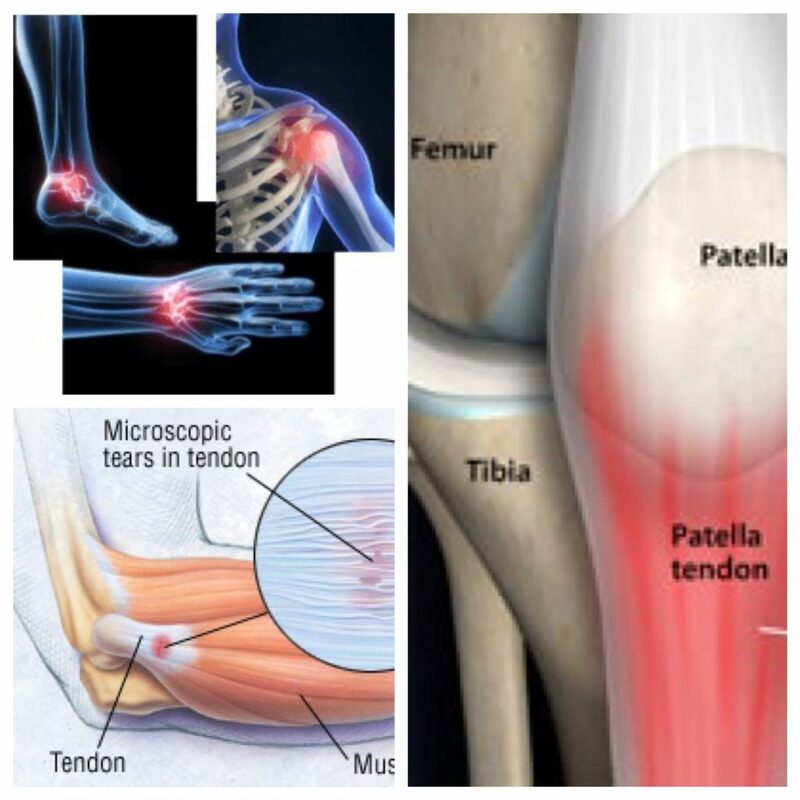 Tendonitis is the inflammation of the tendon (the suffix “itis” means inflammation), which results from micro-tears that is caused when a joint is over loaded with a force that is too heavy and/or too quick. This is an acute injury, and the patient will experience localized pain, swelling, warmth and redness. The goal of treatment is to reduce inflammation, which includes resting the affected joint, icing, and often taking anti-inflammatories such as NSAIDS, ibuprofen (Advil) or naproxen (Aleve). Tendonitis often recovers with in several weeks. Although most tendonopathies have previously been diagnosed as tendonitis, it is actually quite rare, and many injuries fall under the proper term tendinosis. The primary difference between tendonitis and tendonosis is that inflammation is generally not present in tendonosis. Tendonosis occurs when the tendon does not have time to heal, or suffers from repetitive trauma. Small movements, such as clicking a mouse, can cause tendonosis when done repeatedly. Chronic micro-tears and over use leads to loss of collagen realignment, resulting in loss of strength, poor blood supply, degenerative changes and increases the chance of reinjury. The primary treatment goals for tendonosis is to break the injury cycle and reduce adhesions, optimize collagen production, and increase circulation. In chronic tendonitis, inflammation and swelling is present, where as in tendonosis there is adhesions and tendon thickening. In both cases, there is pain during and after activity, decreased range of motion, strength, and circulation. Massage benefits anyone experiencing a tendon over use injury, and each treatment is different depending on the stage of injury. If it is new, the goal will be to decrease any swelling in the area. Once swelling is no longer present, therapy will involve addressing muscles affected by the injury. The muscle attached to the tendon, as well as those compensating, need to be addressed to decrease the tone and trigger points that may be causing more pain. A technique called frictions is also used to disrupt and break down existing adhesions in the tendons to help properly realign the collagen fibers. It is important during treatment, and as self-care, to continue taking the injured joint through pain free range of motion and stretches. A progressive strengthening program can be implemented when local tenderness and pain during activity is gone, as well as a full pain free stretch. Yesterday’s meal prep was all about making sauces. When I first joined this diet, I have to admit, I was a little nervous. I was never good at prepping my meals; or I just didn’t care enough to do it. That’s what this Whole30 diet has taught me so far. It has forced me to step outside of my comfort zone and really start to think about what kind of foods I am eating. At first, my meals were pretty simplistic, nothing fancy just preparing meat and veggies to give me sustenance. But as the days went on, I started to get more inspired not just by the diet itself but by the amazing group of women who are doing the diet with me. What amazes me is the support we have for each other. We give each other tips and tricks, share pictures of our dinners and snacks, and ask questions when we are stumped. If you’re thinking about doing this Whole30 diet, I recommend doing it with someone else or with a group for those reasons alone. You will be less inclined to give in to foods you should be avoiding and you will get a sense of unity and that you are all in this together. Getting back to the sauces. Yesterday, I decided to dedicate the whole day to cooking. Along with the dinner I was making, which included marinated chicken with cauliflowers, I made a roasted red pepper sauce to go along with it. I also decided to make some baba ganoush; something to store in the fridge and take out anytime I feel like a snack or an extra side dish. 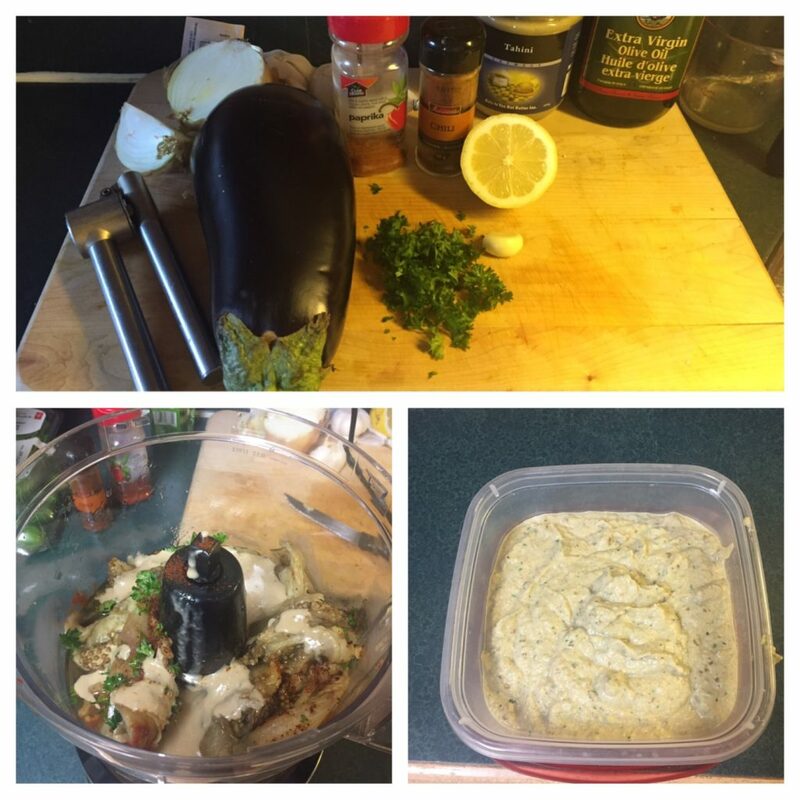 With the baba ganoush, I started out by roasting the eggplant in the oven for 40 minutes; once it was ready I let it cool, then put the contents of the eggplant into a food processor. I added some other ingredients like parsley, tahini, spices, lemon juice and mixed it all together. It turned out amazing! Throughout the week, I will be making more sauces and side dishes to store in the fridge as a go to for any breakfast, lunch or dinner meal. Next up is some homemade tabbouleh, which will be made with cauliflower rice, parsley, cucumbers, tomatoes, spices and oils; along with some nut butter, made out of almonds and hazelnuts which is perfect as a dip for fruit. The nut butter is loaded with healthy fats and essential nutrients and is perfect for a quick snack. Even though I look forward to getting back to eating ice cream, I will definitely do it in moderation and continue to get inspired by new recipes and new ways to prepare food. I am happy I joined this diet; it has decreased my bloating, it has given me more energy, and overall has made me start thinking about adapting to a new healthy lifestyle! Join us 5:00pm June 3rd at Breakthrough Bootcamp, 2880 Argentia Rd, Mississauga. We are helping raise money towards Community Living Mississauga; an organization that supports individuals with intellectual disabilities. It’s going to be a fun night out with games, raffles, food, prizes and of course treatments from us! All donations received for treatments will be going to Community Living Mississauga! 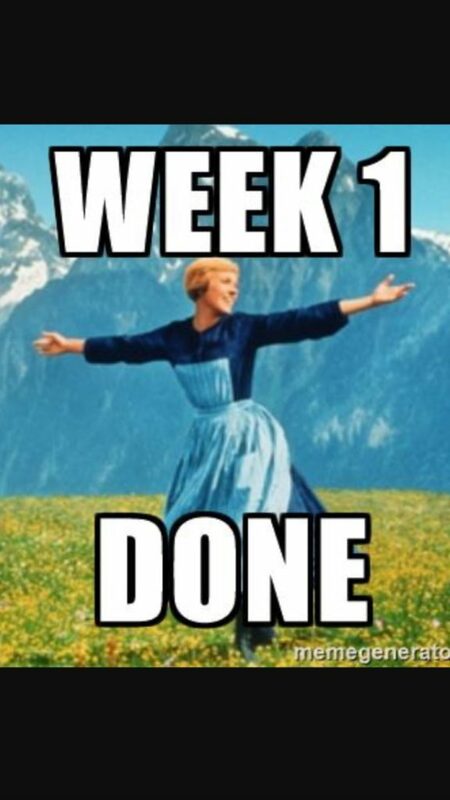 Well, I made it through week 1! I bet you are all curious how it’s going with 6 women in our office on this special elimination diet….and to be honest I thought it would be a big grumpy disaster around the office, but in reality it has been amazing! If I can just take a minute to thank everyone doing this with me, Chelsea, Tavia, Carly, Klara, and Sheila, you ladies are rocking it! If you are a patient here, you know that our office is a very tight knight, inclusive, and very supportive environment. These ladies are the most positive bunch you will find anywhere. There has been a lot of recipe sharing, food processor miracles, smoothie mishaps, and a bit of mushy cauliflower rice…ick….but overall this week is a huge success. You might be wondering why on earth I would all choose to do this program. Well let me tell you. I am a person with a few digestive challenges, and in recent months have gotten to a point that I needed to do an elimination diet. So I came across this diet and it was the perfect thing for me! I actually became a nutritionist because of my own digestive challenges, so as you can imagine, I have tried every way of eating, every fad known to man. My energy was less than low, my digestion was angry, my headaches were constant, and my concentration was getting worse by the day, not to mention the constant weight gain and stress. Let’s just say I was at my lowest place health-wise I had ever been despite having all my nutrition knowledge. Like everyone else, life caught up with me and stress took me down! I am a full time student of Osteopathy so my workload is beyond heavy and the stress is like nothing I have ever experienced before. I knew that in order for me to graduate with my degree and my health and happiness something had to be done! Enter, Whole 30! Now, one week in, I actually got up 1 hour earlier this morning; before coming to work, to cook. And then I had time to package it all up, and eat breakfast sitting at my table, relaxed. And I am NOT exhausted! I have much more energy, my attitude is far more positive and happy, I am dealing with stress better, my stomach has not complained more than once this week(which has not happened in months! ), and I am starting to sleep better. Some of the other benefits this week have been more habitual changes. I have started cooking again; and in turn cleaning my kitchen daily, which has lessened my stress. I have started paying more attention to food products and to how much I was consuming versus how much I am consuming now. I have gone back to regular exercise for the pure enjoyment of it, instead of to work off the extra calories, which was a huge victory for me as I have had to stop exercising due to health. I was a competitive athlete my entire life, so to be unable to exercise was actually causing me stress. To be back at it, even just 3 days a week with a few hikes thrown in as well has been so uplifting and encouraging. All in all, Whole 30 week 1 is a huge success! It can only get better from here! If you have been thinking about joining us but think you missed the deadline, don’t worry you can still participate! You can start any time, I am always here as a resource for you as I will be following the program beyond the 30 days. All it takes is the cost of a 30 minutes visit with myself Jaclyn Clarkson (Holistic Nutritionist), to explain how it will work, and give you a package of information. I am available for all your questions, challenges, and recipe needs! If you want to learn more about it, or would like to book your appointment to get started, please call us at 905-257-5888, or go online to book an appointment with me at www.themassageclinic.ca . Join us for the Whole30 Challenge! Are you ready to change your life? Well, I am! Join myself (Jaclyn Clarkson R.H.N.) and some of the staff here at The Massage Clinic Health Centres and change the way you think about food. Yes, you will need to have a little bit of will power for a month; but its only 30 days of your life. We aren’t asking you to drink some crazy concoction, or eat nothing but salad, but what we are asking is that you cut out all the junk. For example, we will not ask you to cut out coffee, but you will need to drink it black (yep, no milk). No more McDonald’s runs, or stopping for a quick bagel at Tim’s. The trickiest part will be undoubtedly cutting out grains and legumes and natural added sugars such as honey and maple syrup. Be honest with yourself, if you feel tired, sluggish, gained a few extra pounds over the last few years, feel stressed all the time and have no desire to go to the gym; maybe this is just what you need! • Helpful information on proteins, fats, carbohydrates, portion control etc. • 15 minute session after to follow up on how you did, your new measurements and a proud finisher photo! • Follow all the rules exactly, if you cheat you must start fresh from Day 1! So don’t cheat, it is an honour system of course, but we hope everyone will be honest about any slip ups. • Contact me for support or with any questions any time during the process. Anyone! The age is restricted from 16-100 years old. Whether you are a current patient at our clinic are would be coming in for the first time, everyone is welcome. If you have specific medical conditions surrounding your diet, we need to get medical clearance from your doctor before you begin, but remember that this program is well balanced, real food, that is healthy for everyone. Follow some of our staff members and myself as we do this program with you and post about it on our blog! Follow up sessions after we finish will happen Thursday June 15 or Friday June 16. We will be able to accommodate people who cannot come into the office on those exact dates. Sign-Up: Book your appointment with Jaclyn at the reception desk, in-person, by phone, or by email. You will be provided the materials for free that you will need to complete the process. There is the cost of 1 nutritional session with myself (Jaclyn Clarkson) which is split into two sessions, one before and one after the 30 days. $60 payable at the initial appointment. Or speak to one of our lovely receptionists to make your appointment today!